Kendo (剣道 kendō, lit. « sword way ») is a modern Japanese martial art, which descended from swordsmanship (kenjutsu) and uses bamboo swords (shinai) and protective armour (bōgu). Today, it is widely practiced within Japan and many other nations across the world. In addition, the inscription on the gravestone of Yamada Heizaemon Mitsunori’s (Ippūsai) (山田平左衛門光徳(一風斎), 1638–1718) third son Naganuma Shirōzaemon Kunisato (長沼 四郎左衛門 国郷, 1688–1767), the 8th headmaster of the Kashima Shinden Jikishinkage-ryū Kenjutsu, states that his exploits included improving the bokuto and shinai, and refining the armour by adding a metal grille to the men (head piece) and thick cotton protective coverings to the kote (gauntlets). Kunisato inherited the tradition from his father Heizaemon in 1708, and the two of them worked hard together to improve the bogu until Heizaemon’s death. The DNBK changed the name of the sporting form of swordsmanship, called gekiken, (Kyūjitai: 擊劍; Shinjitai: 撃剣, « hitting sword ») to kendō in 1920. Kendo (along with other martial arts) was banned in Japan in 1946 by the occupying powers. This was part of « the removal and exclusion from public life of militaristic and ultra nationalistic persons » in response to the wartime militarisation of martial arts instruction in Japan. The DNBK was also disbanded. Kendo was allowed to return to the curriculum in 1950 (first as « shinai competition » (竹刀競技shinai kyōgi) and then as kendo from 1952). 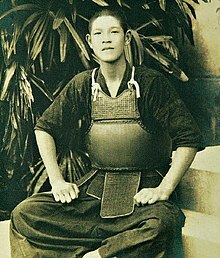 Lee Teng-hui, later President of Taiwan, wearing kendo protector as a junior high school student in Taiwan under Japanese rule. The All Japan Kendo Federation (AJKF or ZNKR) was founded in 1952, immediately after Japan’s independence was restored and the ban on martial arts in Japan was lifted. It was formed on the principle of kendo not as a martial art but as educational sport, and it has continued to be practiced as such to this day. Practitioners of kendo are called kendōka (剣道家), meaning « someone who practices kendo », or occasionally kenshi (剣士), meaning « swordsman ». The old term of kendoists is sometimes used. The « Kodansha Meibo » (a register of dan graded members of the All Japan Kendo Federation) shows that as of September 2007, there were 1.48 million registered dan graded kendōka in Japan. According to the survey conducted by the All Japan Kendo Federation, the number of active kendo practitioners in Japan is 477,000 in which 290,000 dan holders are included. From these figures, the All Japan Kendo Federation estimates that the number of « kendōka » in Japan is 1.66 million, with over 6 million practitioners worldwide, by adding the number of the registered dan holders and the active kendo practitioners without dan grade. In 1975, the All Japan Kendo Federation (AJKF) developed then published « The Concept and Purpose of Kendo » which is reproduced below. Kendo is practiced wearing a traditional Japanese style of clothing, protective armour (防具bōgu) and using one or, less commonly, two shinai (竹刀shinai). The shinai is meant to represent a Japanese sword (katana) and is made up of four bamboo slats, which are held together by leather fittings. A modern variation of a shinai with carbon fiber reinforced resin slats is also used. 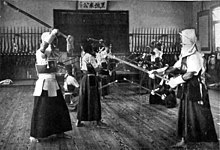 Kendōka also use hard wooden swords (木刀bokutō) to practice kata. Protective armour is worn to protect specified target areas on the head, arms and body. The head is protected by a stylised helmet, called men (面), with a metal grille (面金men-gane) to protect the face, a series of hard leather and fabric flaps (突垂れtsuki-dare) to protect the throat, and padded fabric flaps (面垂れmen-dare) to protect the side of the neck and shoulders. The forearms, wrists, and hands are protected by long, thickly padded fabric gloves called kote (小手). The torso is protected by a breastplate (胴dō), while the waist and groin area is protected by the tare (垂れ), consisting of three thick vertical fabric flaps or faulds. A cotton towel (手拭いtenugui) is wrapped around the head, under the men, to absorb perspiration and provide a base for the men to fit comfortably. Like some other martial arts, kendōka train and fight barefoot. Kendo is ideally practiced in a purpose-built dōjō, though standard sports halls and other venues are often used. An appropriate venue has a clean and well-sprung wooden floor, suitable for fumikomi-ashi. Kendo techniques comprise both strikes and thrusts. Strikes are only made towards specified target areas (打突-部位datotsu-bui) on the wrists, head, or body, all of which are protected by armour. The targets are men, sayu-men or yoko-men (upper, left or right side of the men), the right kote at any time, the left kote when it is in a raised position, and the left or right side of the dō. Thrusts (突きtsuki) are only allowed to the throat. However, since an incorrectly performed thrust could cause serious injury to the opponent’s neck, thrusting techniques in free practice and competition are often restricted to senior dan graded kendōka. This is a technique used when one’s opponent has weak kisei (spirit, vigour) or when they yield a suki under pressure. Always hold kisei and strike quickly. Body and shinai will lose balance as you strike or when being attacked. This technique takes advantage of this to help execute a strike. A good example is Hikibana-kote, when a strike is made to an opponent’s kote as they feel threatened and raise their kensenas you push forward. There are two types. The first is for moving to the next waza after a failed first strike, and the second holds your opponent’s attention and posture to create the suki for a second strike. The former requires a continuous rhythm of correct strikes. The latter requires continuous execution of waza, to take advantage of your opponent’s suki. This can be used if one’s opponent’s kamae has no suki when your opponent tries to attack. Your opponent’s shinai is either knocked down from above or swept up from below with a resulting strike just when his/her kamae is broken. This technique involves striking your opponent as you realise he/she is about to strike. This is because their concentration will be on striking and their posture will have no flexibility to respond. Thus debana-waza is ideal. This can be to any part of your opponent’s body, with valid strikes being: debana-men, debana-kote, and debana-tsuki. Avoiding an attack from another, then instantly responding. Here, timing has to be correct. A response that is too slow or fast may not be effective. Therefore, close attention to an opponent’s every move is required. If struck by an opponent’s shinai, this technique sweeps up their shinai in a rising-slide motion, with the right (ura) or left (omote) side of the shinai. Then strike in the direction of their shinai, or at the suki resulting from their composure’s collapse. This technique needs to be smooth. That is, don’t separate the rising-slide motion and the upward-sweeping motion or it will not be successful. Valid strikes include: men-suriage-men, kote-suriage-men, men-suriage-do, kote-suriage-kote, and tsuki-suriage-men. This waza knocks an opponent’s shinai to the right or left. This neutralises a potential strike and gives the ideal chance to strike as an opponent is off-balance. For success, an opponent’s maai has to be correctly perceived and then one knocks down their shinaibefore their arm fully extends. Valid examples are: do-uchiotoshi-men and tsuki-uchiotoshi-men. Datotsu-bu of the ‘shinai’ is the forward, or blade side (jin-bu) of the top third (monouchi) of the shinai. In competition, there are usually three referees (審判shinpan). Each referee holds a red flag and a white flag in opposing hands. To award a point, a referee raises the flag corresponding to the colour of the ribbon worn by the scoring competitor. Usually at least two referees must agree for a point to be awarded. The match continues until a pronouncement of the point that has been scored. The World Kendo Championships have been held every three years since 1970. They are organised by the International Kendo Federation (FIK) with the support of the host nation’s kendo federation. The European championship is held every year, except in those years in which there is a world championship. Kendo is also one of the martial arts in the World Combat Games. Technical achievement in kendo is measured by advancement in grade, rank or level. The kyū (級) and dan (段) grading system, created in 1883, is used to indicate one’s proficiency in kendo. The dan levels are from first-dan (初段sho-dan) to tenth-dan (十段jū-dan). There are usually six grades below first-dan, known as kyu. The kyu numbering is in reverse order, with first kyu (一級ikkyū) being the grade immediately below first dan, and sixth kyu (六級rokkyū) being the lowest grade. There are no visible differences in dress between kendo grades; those below dan-level may dress the same as those above dan-level. Titles (称号shōgō) can be earned in addition to the above dan grades by kendōka of a defined dan grade. These are renshi (錬士), kyōshi (教士), and hanshi (範士). The title is affixed to the front of the dan grade when said, for example renshi roku-dan (錬士六段). The qualifications for each title are below. Kata, are fixed patterns that teach kendoka the basic elements of swordsmanship. The kata include fundamental techniques of attacking and counter-attacking, and have useful practical application in general kendo. There are ten Nihon Kendō Kata (日本剣道形). These are generally practised with wooden swords (木刀bokutō or bokken). Occasionally, real swords or swords with a blunt edge, called kata-yō (形用) or ha-biki (刃引), may be used for display of kata. In 2003, the All Japan Kendo Federation introduced Bokutō Ni Yoru Kendō Kihon-waza Keiko-hō (木刀による剣道基本技稽古法), a set of basic exercises using a bokuto. This form of practice, is intended primarily for kendōka up to second dan (二段ni-dan), but is very useful for all kendo students which are organised under FIK. Many national and regional organisations manage and promote kendo activities outside Japan. The major organising body is the International Kendo Federation (FIK). The FIK is a non-governmental international federation of national and regional kendo organisations. An aim of the FIK is to provide a link between Japan and the international kendo community and to promote and popularise kendo, iaido and jodo. The FIK was established in 1970 with 17 national federations. The number of affiliated and recognised organisations has increased over the years to 57 (as of May 2015). The FIK is recognised by SportAccord as a ‘Full Member’. and by the World Anti-Doping Agency.